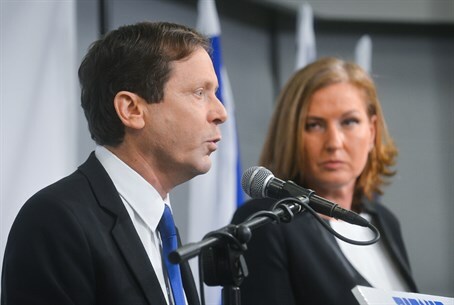 MKs Yitzhak Herzog and Tzipi Livni criticize the PA's decision to turn to the ICC, say Israel will protect its soldiers. MKs Yitzhak Herzog and Tzipi Livni, who head the joint Labor-Hatnua list for the March elections, on Wednesday evening joined a slew of politicians who condemned the Palestinian Authority’s (PA) decision to turn to the International Criminal Court (ICC) after its defeat in the United Nations. Herzog and Livni’s headquarters said that joining the ICC “will not achieve the Palestinians’ goals”. "We will protect IDF soldiers and officers and provide them with a political and legal bullet-proof vest,” they added. Yesh Atid chairman MK Yair Lapid also strongly condemned the decision, saying it was a "big mistake." PA Chairman Mahmoud Abbas signed the Rome Statute on Wednesday, which would enable the PA to file lawsuits against Israel at the ICC. Along with the Rome Statute, Abbas signed applications to join 20 other international conventions during a meeting broadcast live on PA television. "The one who should fear the International Criminal Court at the Hague is the Palestinian Authority, which is in a unity government with Hamas, a declared terrorist organization like ISIS that commits war crimes," Netanyahu stated. "We will take steps in response and we will defend the soldiers of the IDF, the most moral army in the world," he continued. "We will repel this latest effort to force diktats on us, just as we have repelled the Palestinian turn to the UN Security Council." Foreign Minister Avigdor Liberman harshly criticized Abbas over the move, noting that any "deaf, blind, and dumb" judge in a criminal court would find the PA - not Israel - guilty of war crimes. "Abbas can sign any treaty that he wants - the only ones who commit war crimes in the conflict here are the Palestinians themselves, who are responsible for murderous rampages against babies, children, women and men, without distinction, for a hundred years," Liberman fired. "This is something a deaf, blind, and dumb judge would know." "Abbas doesn't threaten us - Israel has the most moral army in the world!" he added.